RUSH: Hey, hey, hey! Greetings, my friends, and welcome. It’s great to be back with you. Rush Limbaugh here at the Excellence in Broadcasting Network and a full week of broadcast excellence now officially underway. Looking forward to chatting with you today. Telephone number, 800-282-2882. The email address, ElRushbo@eibnet.us. 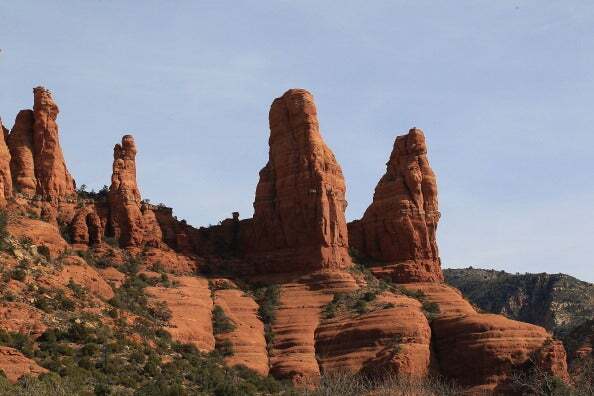 So I was off Friday because I had to go to Sedona, Arizona, for a wedding. My cousin once removed, Stephen Nathaniel Limbaugh III, got married to Jennifer Bond, now Jennifer Bond-Limbaugh of Phoenix — the famous Bond family of Phoenix — and it was a great, great wedding. It was at the L’Auberge de Sedona, a beautiful setting along the creek there. I have to tell you a little story. My drivers that picked us at the airport and took us around all weekend were from Venice. He said, “Well, the Red Rocks remind us of the Valpolicella,” which is a wine. It’s a famous (laughing) Italian red wine.